This post represents another installment in the series detailing the first of our three cross country National Parks camping trips with our travel trailer in tow. The Merriam-Webster online dictionary uses the following phrases (among others) to define the word “epiphany”: (1) a usually sudden manifestation or perception of the essential nature or meaning of something; (2) an intuitive grasp of reality through something (such as an event) usually simple and striking; and (3) an illuminating discovery, realization, or disclosure; a revealing scene or moment. Well, let me tell you, people, I had a camping epiphany in Yellowstone National Park and it happened in the Madison Campground. When Alan and I first started tent camping as young adults, we were fans of KOA Campgrounds – and still are, for the most part. We liked that the majority of them were safe and well-run, and provided us with certain amenities that were important to us at the time. Later on, when we began camping with our first travel trailer, our kids were young and our focus remained on KOAs and other privately owned campgrounds and RV parks that had swimming pools and children’s activities. We became accustomed to full hookups and kiddie playgrounds and that was absolutely the right choice for us during that stage of our lives. And I do understand that it’s a choice that’s still right for many, many RVers – whether they have kids or not! For this trip – the first of our three cross country National Parks trips with our travel trailer - I had booked reservations at private campgrounds all along the way (with only a few exceptions) and we had good experiences with every single one of them. 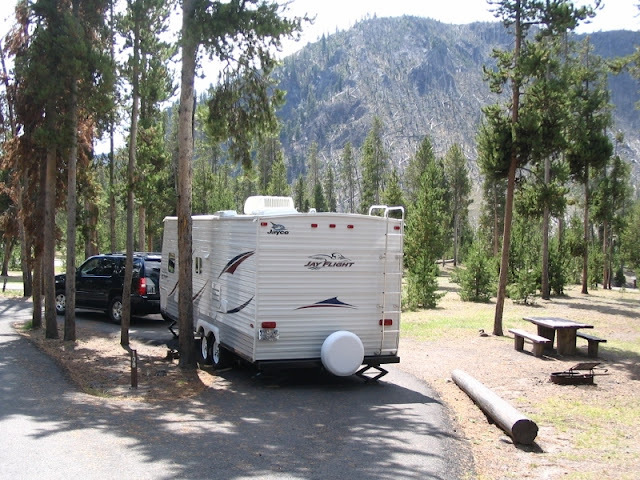 In fact, when we first rolled into West Yellowstone, we spent three nights at the Yellowstone Grizzly RV Park. The sites were lovely, the playground was appealing and the fresh coffee and hot chocolate from the office started our days off on the right foot. But we were eagerly looking forward to a couple days of “dry camping” in Yellowstone with our friends Bob and Audrey to see what it was like. Our first experience camping in a National Park! 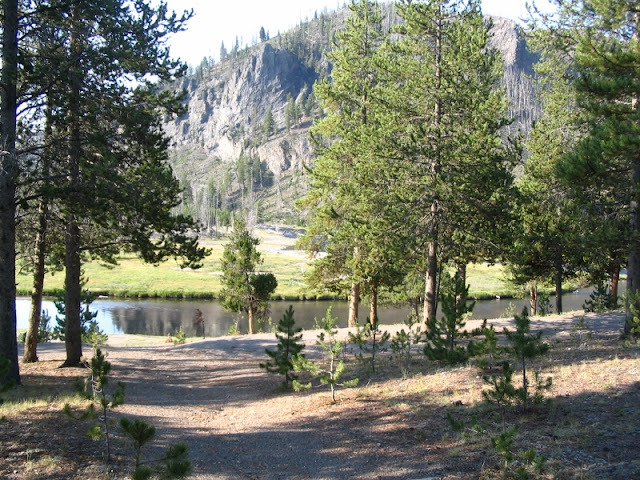 Choosing a campground without any water, electric or sewer hookups was not unusual for our friends, but it would provide our family with a new experience and put us closer to the areas of the Park that we wanted to visit. What I didn’t realize at the time, however, was how waking up in the Park with nothing but the hills, grasslands and rivers of Yellowstone around us would forever change my view of what camping meant (a usually sudden manifestation or perception of the essential nature or meaning of something). I will never forget that campsite; it will remain in my mind’s eye forever (an illuminating discovery, realization, or disclosure; a revealing scene or moment). And I won’t forget the feeling of awe that it inspired, the solitude it allowed us or the realization that the peace that is nature’s gift to us could so easily be found within the Park (an intuitive grasp of reality through something - such as an event - usually simple and striking). Those folks at Merriam-Webster really know what they're talking about! The two days and nights we stayed in Madison proved to be a turning point for our family and, from that point forward, our sites of choice have always been in the campgrounds of State and National Parks. Certainly, there are some public campgrounds that have the characteristics of private campgrounds – and some private ones that have the characteristics of public ones. But Alan and I realized that it is the campgrounds in State and National Parks that provide the settings that we love (mountain meadows, waterfalls, hiking trails and lake access) and more plentiful opportunities to engage in the activities we enjoy (hiking, biking, kayaking and simply exploring), that we often can’t find in private parks. The states and our federal government own some gorgeous properties and, for our family, it’s all about location, location, location! Waking up in the Park – whatever and wherever the Park – is simply magical. There is something so special about that first cup of morning coffee if you’re enjoying it as the sun peeks up over the horizon or you're watching the deer feeding in the field across the way or you realize that, yes, that really is part of the Grand Canyon just steps away from your campsite. Plus, waking up in the Park gives us a jump start to each day, allowing us to begin doing fun activities in the Park as opposed to driving to the Park. Do we ever stay in private campgrounds? Yes, absolutely! If we happen to be traveling in the summer and temps are expected to be high, then access to electricity for air conditioning is a must for us. Who wants to sleep in a puddle of sweat? I mean, perspiration. If visiting a particular destination requires a ridiculously long commute from the closest State Park, then we’ll go with a private park situated near that destination. If our rig is too large to fit in a particular Park’s campground – as sometimes happens with the older public campgrounds – we’ll choose a private one nearby. And then there are times when a very specific private campground or RV park is calling our name – looking at you Enchanted Trails on Historic Route 66, Albuquerque, New Mexico! But it’s the State Park and National Park campgrounds that have earned our devotion as a result of the gifts they often provide: fresh air, spectacular views, rippling waters and the solitude that feeds our souls. I will admit that camping in State and National Parks can be inconvenient. Although some do offer full hookups (yay! ), very often electric and sewer hookups are not available and you will, most likely, have to walk to a water spigot. I completely understand why this situation wouldn’t appeal to everyone. Our creature comforts are, well, comfortable! And it’s no fun lugging water containers back to your RV from three sites down or having to make a separate run to the dump station with a portable waste tank when your RV tanks fill up. 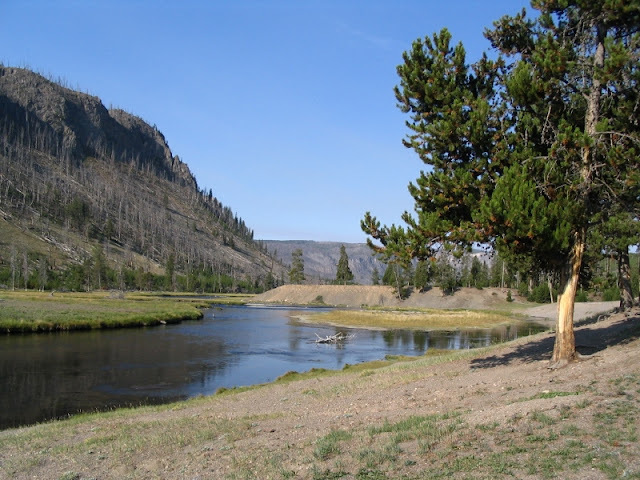 But, as our family found out at Yellowstone, those inconveniences are simply minor irritations and the advantages of staying in the Park most definitely outweigh them. I believe that the Madison Campground taught Alan and me who we were deep down in our hearts. The two of us reached a different, deeper level of relaxation in that camping experience at Yellowstone than we ever had before. We enjoyed our morning coffee with the sounds of nature and a gorgeous view. Our family spent an evening around the campfire with our friends Bob and Audrey surrounded by . . . nothing. Nothing but the trees, the hills, the river, the stars and whatever critters were out there. We found a peace in Madison that we hadn’t found elsewhere. I have nothing against private campgrounds and we continue to camp in them when they meet our needs. And I know many of you love the amenities or even just the vibe that private campgrounds offer. You know what I say to that? To each his own! That’s exactly why there are so many different types of campgrounds and RV parks around! 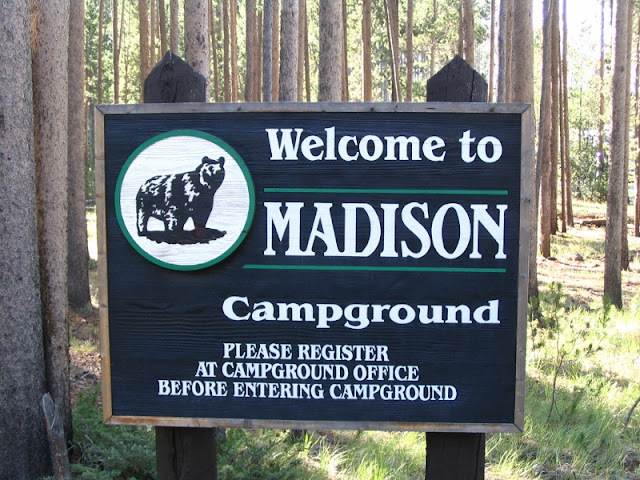 It took Alan and me a while to determine our niche in the wonderful world of camping, but the Madison Campground in Yellowstone National Park will forever be known to us as the turning point. It was our first campsite in a National Park and, considering the fact that Yellowstone is our nation’s very first National Park, a fitting place for our “camping epiphany” to occur, don’t you think? Thanks so much for stopping by and bearing with such a long post! I'll bet you figured out that my passion lies within the wild and scenic places throughout our country - and the campgrounds that allow us full access to them. Please come and visit again soon! I admire your appreciation of camping in a natural setting. While Sandy and I enjoy nature as well, we seem to like keeping a tether to civilization that would cause most "real" campers to scoff. But to each his own, right? And watching the sun come up over coffee? Um, I don't think we've ever seen that...we are not morning people. Disgraceful, I know. Well, here's proof that "to each his own" applies to more than just the choice of campsites: If I crawl out of bed after the sun is up, I feel like half the day is shot. If we ever plan to meet, we'd better make it for lunch!